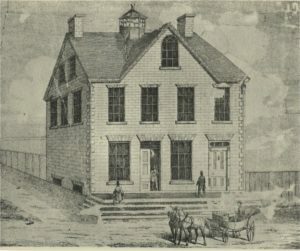 This building was constructed in the mid nineteenth century when commercial traffic on McBean St. was at its height and the village was bustling. George Brown, a former village reeve operated a store here in 1860’s. Little is known about the usage of the building in the last three decades of the century, but in 1900 the Brown Brothers, James & Robert, (no known relation to George) were operating a store at this location, and subsequently moved their business next door. In 1905, the Bank of Ottawa opened its doors in the newly renovated building and in 1928 it became a branch of the Bank of Nova Scotia. In 1923, members of Loyal Orange Lodge (#151) purchased the building; since that time, the upper floors have been used for lodge meetings and social gatherings. In 1970 the bank moved to a new building further north on McBean St. The land patent for lot 9, the west side of McBean St. was granted to Samuel Purdie in 1832. Edward & Margaret Malloch played an important role in the early history of the property. 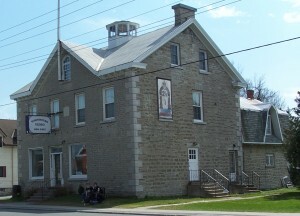 The Mallochs had moved from Richmond to Bytown in 1840 but continued to maintain a close association with the village. Edward had started his career as a village merchant but soon turned to land speculation and owned thousands of acres in various parts of Carleton County. Margaret had come to Richmond in 1818 with her parents Sergeant-Major Andrew Hill and Maria Hill, both of whom were entrepreneurs of note, owning the Masonic Arms Tavern, where the Duke of Richmond spent his last night before his death in 1819. In 1856, the Mallochs sold the land to George Brown an established village merchant. The 1851 Census had listed him as a merchant living in a 1 1/2 storey frame house next door on lot 8. During the 1850’s Mr. Brown was also a village councillor and reeve (1858). It seems that he built his store some time before 1863 and that he and his family lived on the second storey. Records indicate the return of the land to the then widowed Margaret Malloch, in 1869. In 1887, it became the property of Margaret McKenna whose family owned it until 1923. 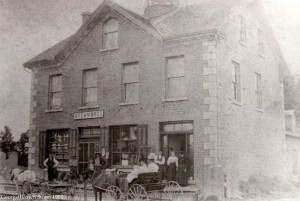 The picture on the right shows the Brown Brothers’ store at the turn of the century. A rear addition had already been built, but the configuration of the doors remained true to the original sketches. In 1905, the building became the location of the first bank in the village, the Bank of Ottawa. To accommodate the bank’s vault, the right hand door, which had provided access to the upper levels, was removed and a new entrance was placed on the north side of the building. Mr. Collis Lewis a descendant of Colonel George T. Burke, Captain John Bower Lewis and Dr. Collis was the bank’s first customer. He was impressed with banking, became a teller and ended his career as a manager of the branch in this building. He, like other managers, lived in the rear extension. After 1923, the upper floors were used exclusively for Orange Lodge activities except for a few months in 1924, when public school classes were held on the second floor because the school had been destroyed by fire. In 1928, after the amalgamation of the Bank of Ottawa and the Bank of Nova Scotia, the bank became a branch of the latter. Ten years later, one of the most exciting moments in village history, and Mr. Lewis’s life, occurred at the bank. On July 19, 1938, three masked men robbed the bank, and a number of bullets flew past Mrs. Lewis as the robbers fled. The bank moved to a new building further north on McBean Street, in 1970. The upper floors continue to be the site of Lodge meetings and social gatherings, while the first floor has been used for a variety of purposes and is presently (2012) a video store. The George Brown Building, built by James Scott, a local stone mason, carpenter and joiner, displays most of the general features of Classical Revival Architecture including a gable roof, quoins (or cornerstones), returned eaves and general symmetry. This 2 1/2 storey stone building has a full basement. The exterior walls are two feet thick fashioned from coursed limestone with a natural finish. Fine cut ashlar quoins highlight the four corners. An ogee window, with its pointed arched top, is located in the central dormer. A wooden octagonal cupola is centered on the roof. All its windows have four panes of glass. Although local folklore insists that the cupola was used as a lookout for marauding Algonquin Indians, it is, in fact, a common architectural detail of the time. Curry, John. Richmond on the Jock. Stittsville ON: The Stittsville New, 1993. Goulbourn Township Historical Society. files located in the Richmond branch OPL. Goulbourn Township Historical Society. Digital Library. Macpherson, Linda. A Social & Architectural History of the George Brown Building. 53 McBean St. Richmond Ontario. prepared for Heritage Carpentry & Millwork, Algonquin College, Perth: 1994. This entry was posted in Locations and tagged bank, commercial, Orange Lodge, store. Bookmark the permalink.